Katia, who with her lovely brother Midou, seem to be the most connected teenagers at Paris Fashion Week! p.s. Last Friday I got to shoot a Christmas editorial feature for my-wardrobe.com. Despite the weather being completely awful (I said lots of pretty please's in the days leading up to it but it didn't seem to work) , I had the most amazing time with the fab team from my-wardrobe, models Danny (Select) and Jessica (FM Agency), make-up artist Andriani (Phamous) and hair stylist Takashi (Phamous). I can't tell you how exciting it is to be asked to work on these kinds of projects (okay, it is REALLY exciting!). You can take a peek at the finished feature here. Thank you so very much my-wardrobe! 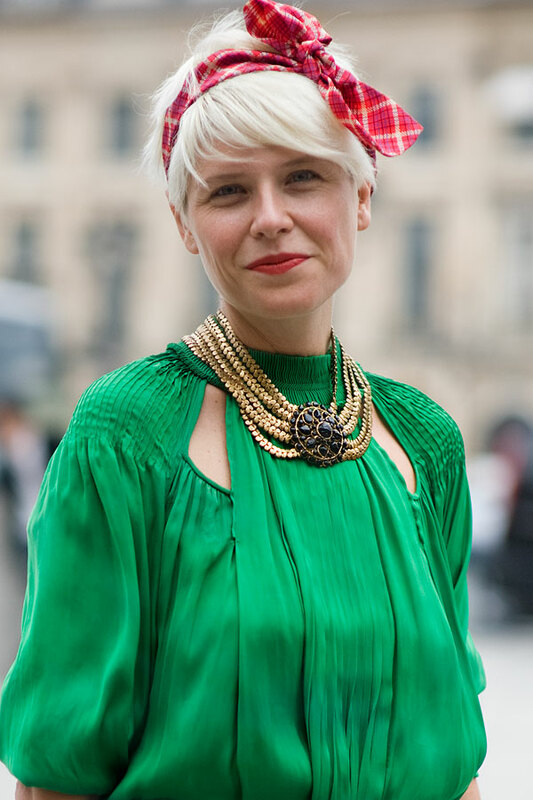 Natalia Alaverdian, Fashion Editor, Harper's Bazaar Russia. 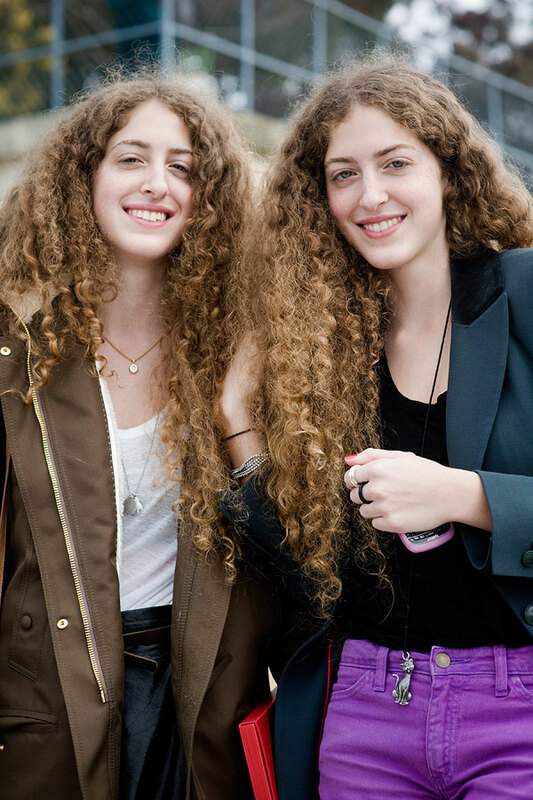 The gorgeous twinnies, Sama and Haya Abu Khadra! Shu Pei Qin after Alexis Mabille. Peony, 1/3 of PRP blog (which stands for photographing real people and also Pete, Rowie and Peony, the creators behind the blog) which popped up during London Fashion Week (and who doesn't love a good pop-up?!). The blog is still up so be sure to check it out and find out what PRP got up to during the week. p.s. I was over at Peony's house last week for afternoon tea (homemade Ottolenghi carrot cake, and cupcakes-helllllllllllloooooooooo!) and was lamenting the current state of my hair (which ever so slightly currently resembles a blonde birds nest). Peony swears by Philip Kingsley products (which I already use) but insists that the way to get gorgeous hair (and hello, look at hers!) that I MUST start brushing my hair twice a day. Um, I have to confess that I haven't brushed my hair twice a day since high school. I am a once a day girl. Anyone else just brush once or am I just horrifically lazy?! Model and actress Elisa Sednaoui after Jason Wu. Not sure of her name (does anyone know??) but I am absolutely fascinated by her. I photographed her for the first time in March at Paris Fashion Week wearing a super cute penguin jumper. London based illustrator Alice Gabb. You can buy Alice's pretty stationery and prints (and very sweet little tweed creatures) from Etsy as well as from her stall at Broadway market every Saturday. Karolina Kurkova after Roberto Cavalli. Rather taken with her jeans and tuxedo jacket combo. Funny, gorgeous, generous and oh-so-photogenic (and not afraid of looking a little bit silly posing for me with her eyes closed outside Chanel! )....my friend Anne-Catherine*. 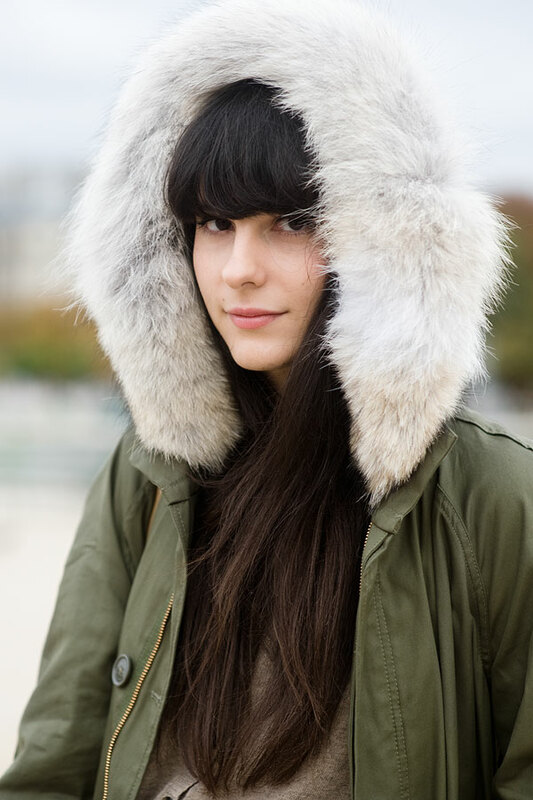 Y'all know Alix: adore that See by Chloe tweedly skirt....and the fur trimmed parka. Check out Alix's latest Halloween inspired shoot with Louise: amazing!! 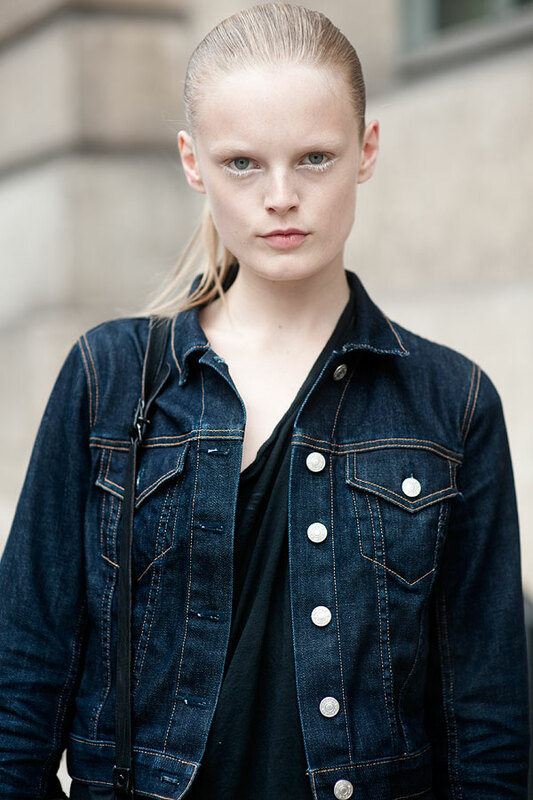 Rianne ten Haken after Emanuel Ungaro. Her cute little motorcycle helmet reminds me of the flying helmet in the current Rolex oyster adverts. Edit: thanks so much everyone! So, this is Marie from A Fashion Tale in Denmark. Elena Perminova who always looks utterly breathtaking. Hannah Holman. 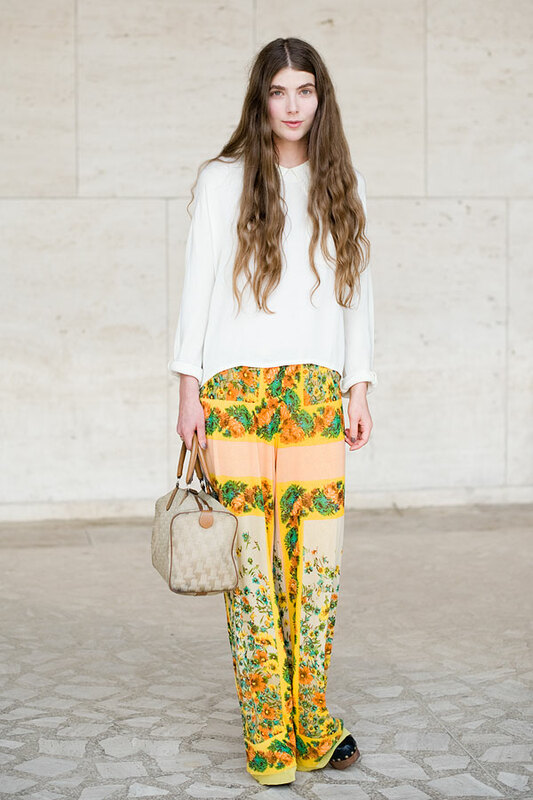 After Peter Som. Lindsey Wixson in Paris (above) and London (below). I absolutely LOVE the Hans Feurer shoot with Lindsey in the 30th Anniversary Special of i-D magazine: her hair (masses of gorgeous blonde afro-esque curls) and the lighting were both sublime. And I like that she likes mint flavoured lip gloss, donuts, chocolate malts and shopping in thrift stores.... reassuringly teenage.